At the invitation of President-elect Andry Rajoelina of the Republic of Madagascar, Special Envoy of President Xi Jinping and Vice Chairman of the National Committee of the CPPCC He Wei will attend the inauguration ceremony of President-elect Andry Rajoelina on January 19 in Madagascar's capital Antananarivo. Q: According to reports, US Vice President Mike Pence made some unfounded accusations against China at the Global Chiefs of Mission Conference, saying that China has shown a disregard for laws and norms and the days of the United States looking the other way are over. What is your comment? A: I have seen relevant reports. I was just wondering if there is a term called "state act of libel"? For quite some time, the US has been launching all kinds of unwarranted accusations, smears and attacks against China on the fronts of debt, trade, the South China Sea, international rules, and religious freedom. But facts have made the strongest refute. Even those who see things clearly inside the US have criticized the US actions. This morning, I saw an article on Bloomberg written by Stephen S. Roach, senior researcher of the Yale University and former chairman of Morgan Stanley Asia. He said that America's charges against China are based on anecdotes and shaky evidence that don't stand up to serious scrutiny. The current US administration would be wise to stop relying on alternative facts. As for international rules, we all see clearly that the US has been so blatant in applying double standards on international rules-choosing to abide by whatever suits its purpose and discarding whatever it finds obstructive. In this regard, the US is the least qualified to point fingers and hurl abuses at China. This year marks the 40th anniversary of the establishment of diplomatic ties between China and the US. Just recently, State Councilor and Foreign Minister Wang Yi gave an exclusive interview to the People's Daily. Some of what he said merit thinking and reflection by the US side. State Councilor Wang Yi said that China and the US share more common interests than differences. Contradictions and disputes shall not define the current China-US ties. 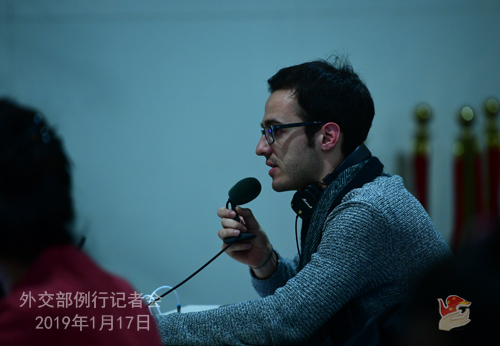 What is more important is that prejudice and misjudgment shall not dictate the future China-US ties. Only with an open mind and inclusive attitude to view things in a momentum of development can bilateral relations break more grounds for development. State Councilor Wang Yi stressed that the right choice must be made when it comes to matters of strategic mutual trust. China is committed to the path of peaceful development. China will not become the US and China has no intention of replacing the US. There will be competition between the two sides, but such competition needs to be positive and conforms with rules. The two sides should be committed to door-opening instead of barrier-erecting, follow the new concept of mutual benefit and win-win results, and discard the outdated mentality of zero-sum game. No malicious attacks shall be allowed to tarnish China-US ties and poison the social foundation of bilateral relations. We hope that the relevant people in the US could view China's development in a correct and rational way, stop using the relevant issues to interfere in China's internal affairs and damage China's interests, do more to promote mutual trust and cooperation between China and the US, and work with China to maintain the sound and steady development of China-US relations. Q: Some US lawmakers have proposed some bill in the hope of blocking the sale of US components to companies like Huawei, ZTE and other Chinese telecommunication companies that violated US sanctions or export control laws. Does China have any response to this? A: I have seen relevant reports about the so-called bill proposed by several US senators. I wonder what do you think of it? I believe such move of these senators just testifies to their extreme hubris as well as lack of confidence. People around the world all know very well the true intention of the US using every possible state apparatus to suppress and block Chinese high-tech companies. Even some wise persons in the US have pointed out sharply the essence and possible consequence of the relevant move by the US. What the US side is doing is not the normal thing a normal country will do, still less a proper behavior for the number one power in the world. The US has made enough framed-up and wrong cases around the globe, and certain people in the US need to correct their mindset and stop before going too far. I want to stress once again that the Chinese side is firmly opposed to the abuse of the so-called export control measures and interference in normal international trade and cooperation between businesses by the US. We urge the relevant US lawmakers to stop their unjustifiable suppression of Chinese businesses, stop getting the relevant bill passed and do more to enhance mutual trust and cooperation between China and the US. Q: According to reports, the US Department of Justice is conducting a criminal probe into Huawei for allegedly theft of trade secrets. Do you think these allegations are warranted and can you make any comments about allegations over Chinese trade secrets theft? A: Are you referring to the 2014 case between T-Mobile and Huawei? (Journalist nods) Our information is that it was a civil dispute between two enterprises and the parties concerned have properly resolved it through legal means. We are concerned over the reports that the US federal prosecutor is conducting criminal investigation into this case, which is rather abnormal. We particularly doubt it real motives. If the US is so ready in expanding and politicizing ordinary civil cases and arbitrarily using state apparatus to suppress Chinese enterprises, it is completely against the rules for free and fair competition as well as the spirit of the rule of law . I would like to reiterate that the Chinese government always encourages its enterprises to observe market principles and international rules as well as local laws while seeking economic cooperation overseas. We hope that the US side could also create a level playing field for Chinese enterprises that carry out normal activities in the US. Q: Yesterday, a senior US administration official said that the US will continue to rely on its nuclear deterrence capabilities to deter potential nuclear attacks from Russia and China because Russia and China have nuclear arsenals of certain scale. I wonder if you have any comments on this? A: We keep hearing these news recently. On the one hand, the US has been demanding others to cut down on weapons. On the other hand, the US has been strengthening its arsenal of massive destructive power. This actually also reflects the double standards of the US side. We hope that the US, as a military superpower and one of the five permanent members of the UN Security Council, could work with other permanent members of the Security Council and make positive contributions to world peace and stability. Q: The National Assembly of Venezuela recently adopted a resolution to invoke the Venezuelan Constitution's Article 233 to form a "transition government" and hold transparent and free elections. It also called on China and other countries to freeze the accounts and assets of the Venezuelan government. What is your comment? A: President Maduro started his new presidential term from this January 10. Many countries and organizations including China had sent representatives to attend his inauguration ceremony. President Maduro announced a series of measures for state governance including economic recovery which are conducive to the improvement of people's livelihood and the interests of all parties. 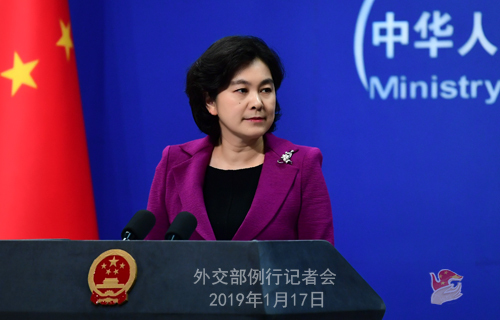 China consistently upholds the principle of non-interference in others' internal affairs and supports the Venezuelan people in independently seeking out a path that suits its national conditions. As for who should lead them in this process, all parties shall respect the choice already made by the Venezuelan people. China stands ready to work with all parties to create favorable conditions for the Venezuelan people to peacefully and independently manage their internal affairs through political dialogues. Q: According to reports, when talking about China-Russia relations at the annual press conference on January 16, Russian Foreign Minister Sergey Lavrov said that Russia has reached a record level in trade with China in 2018, and China and Russia have supported each other in international affairs and within the multilateral framework. China and Russia are friends because they are neighbors that have many common interests. He added that someone should propose signing a peace treaty with Russia to contain China, which arouses deep regret. What's your comment? A: We highly appreciate Foreign Minister Sergey Lavrov's positive comments on China-Russia relations. Just as he said at yesterday's annual press conference, under the strategic guidance of President Xi Jinping and President Vladimir Putin, the China-Russia relations have witnessed unprecedented development with fruitful outcomes across the board in 2018. This year marks the 70th anniversary of the establishment of diplomatic ties between China and Russia. The history of the development of China-Russia relations over the past 70 years has fully showed that the sustained and steady development of China-Russia relations, in particular the continuous high-standard development in recent years, meets the shared aspiration of the two countries and two peoples, serves the common interests of the people of the two countries, and is also a vital strategic stabilizing factor in maintaining world peace. The China-Russia relationship will neither be affected by the ever-changing international landscape nor changed by any particular incident, still less be weakened by discord sowed by any force. Under the current international circumstances, the new type of state-to-state relationship featuring non-alignment, non-confrontation and not targeting any third country between China and Russia has set a model and exemplar for the international community and relations between major countries. The sky is the limit for China-Russia cooperation, and our cooperation can be expanded to any area possible. Taking the opportunity of observing the 70th anniversary of the establishment of diplomatic ties, China stands ready to work with Russia to continue to boost the common development and revitalization of the two countries with more tangible cooperation outcomes. 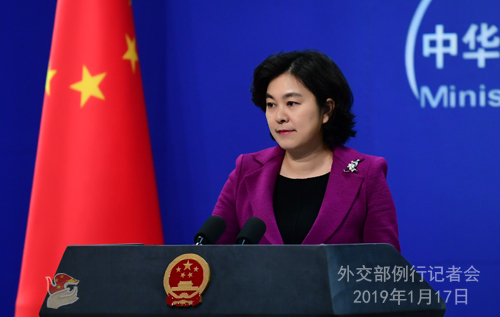 We will continue to maintain close strategic communication and coordination, firmly maintain multilateralism and contribute more positive energy to promoting world peace and stability. Q: Canada has accused the Chinese side of arresting Michael Kovrig for his activities while he was a diplomat, saying this is a violation of the Vienna Convention on Diplomatic Relations. Is China violating Michael Kovrig's diplomatic immunity? A: This case is being investigated by the relevant department in accordance with the law. I am not in the position to disclose specific details. I want to stress that our actions fully comply with international laws including the Vienna Convention on Diplomatic Relations. We have said many times that Michael Kovrig is not currently a diplomat. He came here on ordinary passport with business visa. He was taken compulsory measures for activities endangering national security by relevant Chinese state security organs in accordance with the law and therefore enjoys no immunity in accordance with the Vienna Convention on Diplomatic Relations and other international laws. Q: There are several reports today saying that one of DPRK's top officials is here in Beijing to travel to Washington. Can you confirm whether he will meet with the Chinese side or not? A: I have no specific information in this regard. 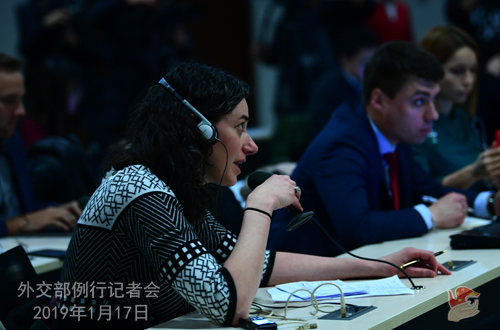 Q: Canadian officials said that according to their understanding of the law, China has two choices with regard to Michael Kovrig, either it can ask Canada to waive his diplomatic immunity or can deport him to Canada. 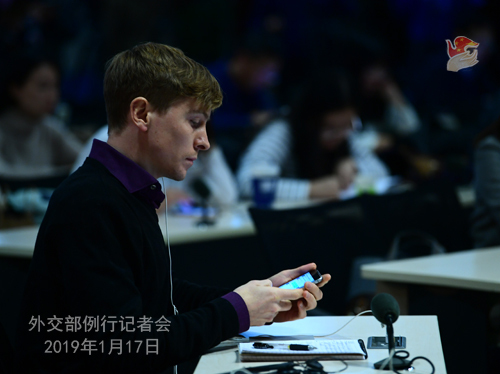 Does the Chinese government believe that the Canadian understanding of the law is correct and has China asked Canada to waive Michael Kovrig's diplomatic immunity? A: The Canadian side has been airing their opinion on the individual case too much often recently, and I won't make any specific comment on this issue. I think I have made it very clear just now that this case is being investigated in accordance with the law by relevant Chinese department. Follow-up: The Canadian Foreign Minister has said that China's actions against Canadian citizens in response to the arrest of Meng Wanzhou over the past few weeks represent a threat to all countries. Do you agree? A: I'm afraid your Foreign Minister is so worried that she even talked indiscreetly like this. What threat has China posed to Canada? The Canadian side has unjustifiably detained a Chinese citizen transiting in Canada, who has violated no Canadian laws at all as the Canadian side itself has admitted, posing a grave threat to the Chinese citizen. You see that? It is Canada rather than China that has posed a threat. The Canadian side might be worried, but it had better refrain from talking such nonsense. This will severely taint the reputation and image of Canada and is not conducive to the settlement of the issue. I would like to add that you could actually turn to the Canadian people for their opinions. I noted that many of them have expressed their viewpoints online in the past few days. In sentencing the Canadian drug trafficker to death penalty in accordance with the law, China is in fact helping the Canadians and people of other countries that are threatened by drugs. We are helping them to get rid of an evil, and how could that be a threat after all? Does the Canadian leader believes that it wouldn't be a threat to allow the drug trafficker to have his way at home? Is that what safety means? We need to have a basic judgment of what is right and what is wrong. The following question was raised after the press conference: In the afternoon of January 15 local time, the Dusit D2 Hotel in the downtown of the Kenyan capital Nairobi came under a terrorist attack, which killed 21 innocent lives and injured more. What is your comment? A: China firmly opposes all forms of terrorism and strongly condemns the terrorist attack in Nairobi, Kenya. We express our deep condolences to the innocent victims and sincere sympathy to the bereaved families and the injured. As a good friend to Kenya, China will continue to unswervingly support Kenya's efforts to maintain national security and regional stability. Due to scheduling reasons, the regular press conference of the Foreign Ministry will be adjourned on January 18 (Friday). During the adjournment, the Spokesperson's Office of the Foreign Ministry will receive your questions via fax and e-mail as usual.